With all the talk of interesting new foods, I wanted to share something my friends and I made last year. 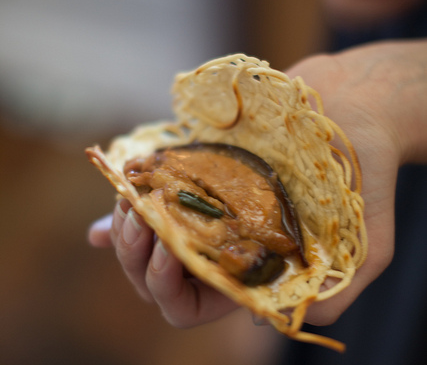 I present to you… the Ramen Taco. A few years ago, Paul and I used to joke about them. Initially we wanted to put ramen noodles in a corn taco shell, but never got around to it. One day on irc, Chris suggested we make some next time we visited. Except we were going to do this from scratch. We consulted with Rickmond, our resident ramen expert, to find the best way to thicken the broth, and decided to make handmade noodles and turn them into shells. I’d never made noodles in my life, and went on an epic quest across Los Angeles to find Kansui, a rare ingredient essential to the noodles. Ranch 99 had it. 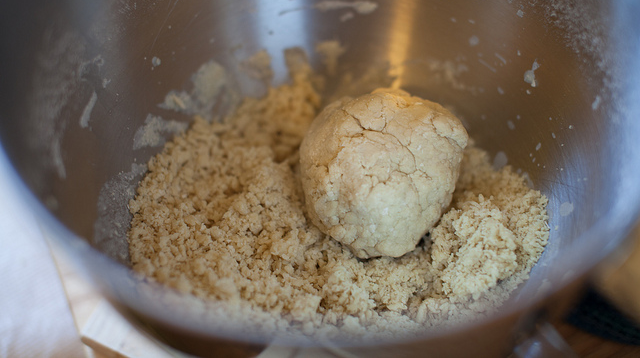 I sort of followed this recipe, and ended up with a very dry ball of dough that I was afraid wouldn’t work. I don’t have a mixer, so I just pounded at it by hand. It took forever and I don’t recommend doing this. Knead them into a ball. Wrap in plastic and throw it in your fridge overnight. Alternate Mixer Directions: Erin and I did this later with a mixer and you use bread hooks and let them run for 10mins. The dough will look like a bowl of fluffy marbles. Roll them into balls and put them in the fridge overnight. 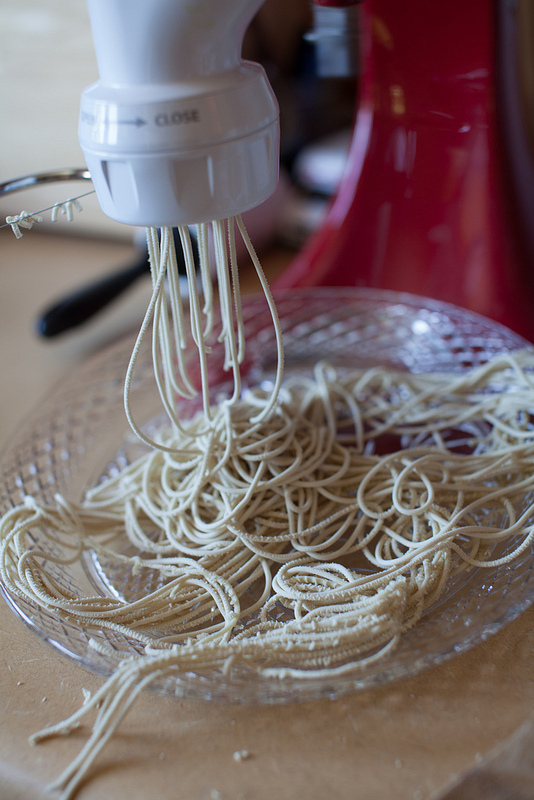 The Next Morning: Real ramen experts can do this with a knife and their hands, but we found throwing a pasta attachment onto a stand mixer made our lives more awesome. 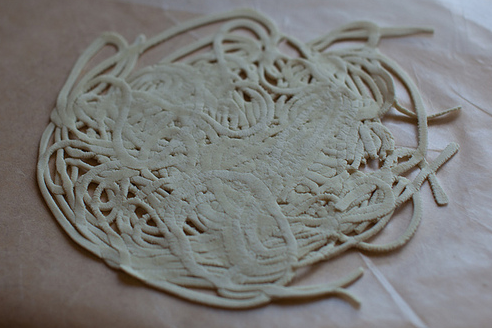 Make the noodles (they will be weirdly dry) and make little piles on some floured wax paper. Then roll them into flattened tortillas. You want the noodle texture to be super obvious, so don’t roll it too hard, but don’t leave so many gaps that your filling makes a mess. Have a heated, oiled frying pan and a pot of boiling water ready. 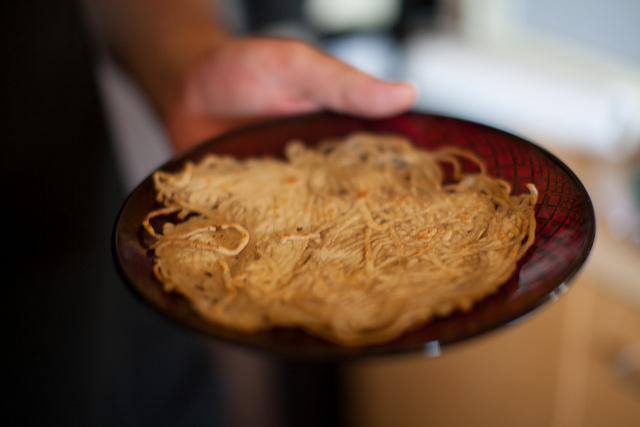 You’re going to boil your tortillas for a few minutes like you would if you were eating ramen. Use some chopsticks or tongs to fish them out and fry them up after. This is key to giving your shell flexibility and chewiness. 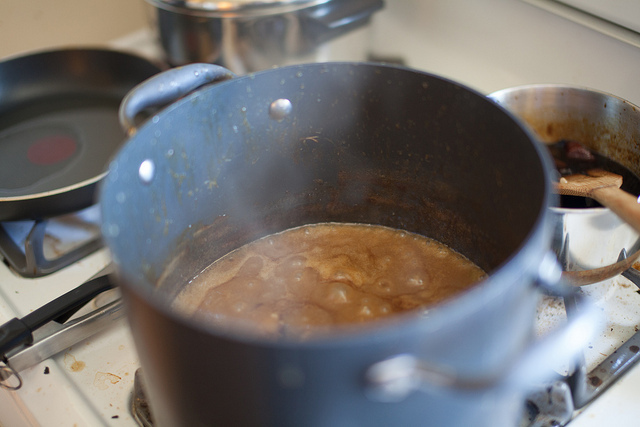 Our concept for the sauce was to make ramen broth from scratch and thicken it. A super good guide for this is here, but I’ll walk you through our steps, too. 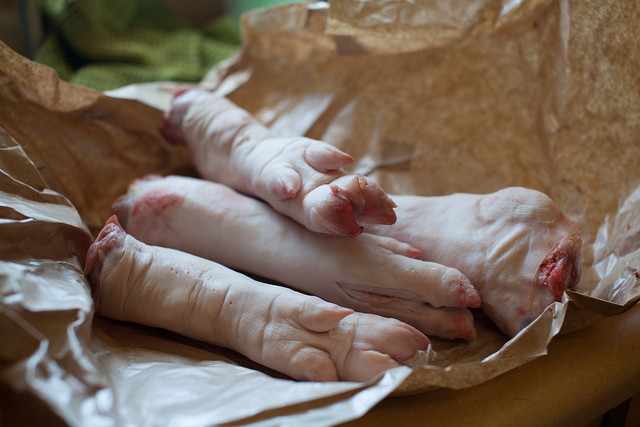 First, talk your local butcher into giving you some pig’s feet and chicken back. Basically grab high quality bones that you want to use as a base. This will take you 2 days to make, so give yourself plenty of time. Erin and Chris made most of the broth. Use a giant knife and cut the feet into 1 inch discs. Alternatively, if you ask your butcher really nice to do it for you, he probably will. Makes it 10x easier. Cut up your chicken back into manageable pieces. Put everything into a stockpot filled with cold water, set the temp to high, and wait until it boils. Remove at that point. Wait until it cools off, and you’re basically going to pop blood vessels. This is a really slow process, but will make the difference between awesome soup and less appealing soup. You want to remove anything that looks like dried blood. A chopstick helps. Saute your onions, garlic, and leek in a skillet. Char them on the sides, cooking for about 15 minutes, then remove from heat. 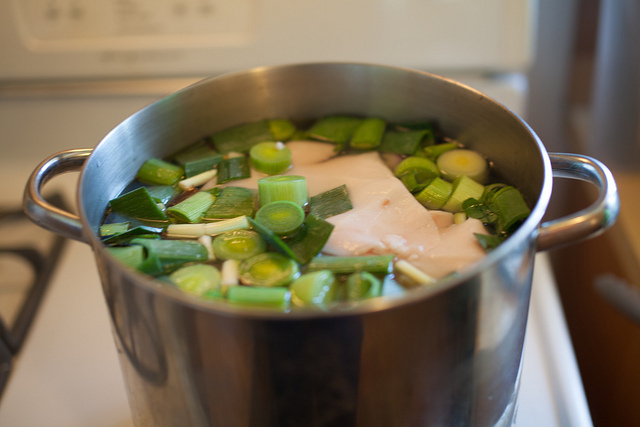 Toss everything back into the pot (all cleaned meats and veggies), including leeks, scallion whites, mushrooms, and pork fatback. 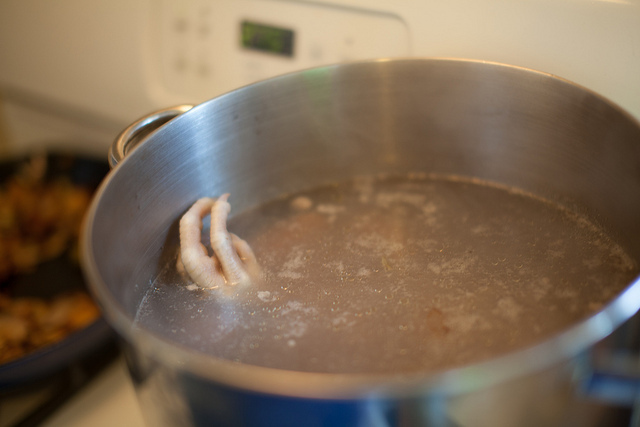 Cover in cold water, and bring it to a rolling boil on high heat. Use a strainer to clear scum off the top- your soup needs some babysitting here. This part takes 20 mins. Then reduce heat and let it simmer, and add a lid onto the pot. Check on it in 15 minutes – it should be boiling slowly. 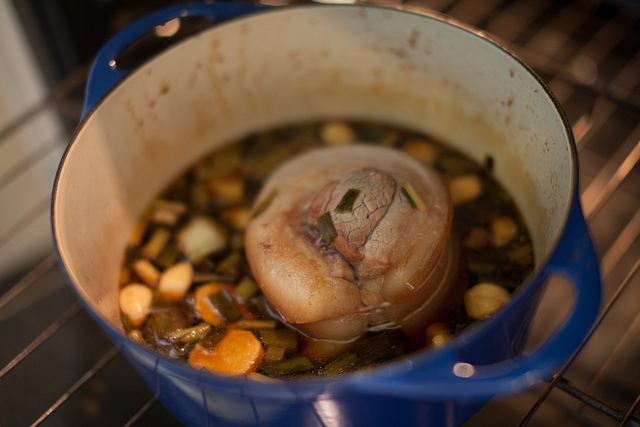 Adjust the heat and cook it until your pork back fat is soft- this might take 4 hours. Remove the backfat and put it in your fridge for later. Return the lid and cook it another 6-8hrs. Add more water if the level drops under your bones. In our case, we made this across two nights. We put the broth in the fridge and were surprised at the amount of fat that solidified. Ramen is fatty broth- don’t skim that out. We let the broth heat back up slowly. 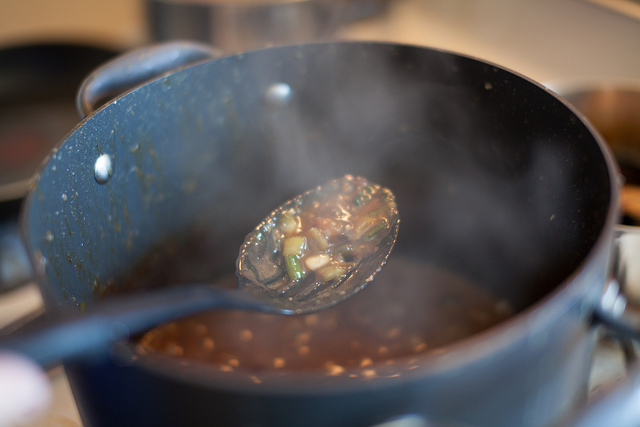 You want to reduce your broth quite a lot to turn it into a thick taco sauce – think consistency of ketchup. Let it boil for a couple hours while you prep other stuff. At this point we tasted it and it was a bit bland and fatty. We added some chopped scallions and soy sauce, and that made it awesome. 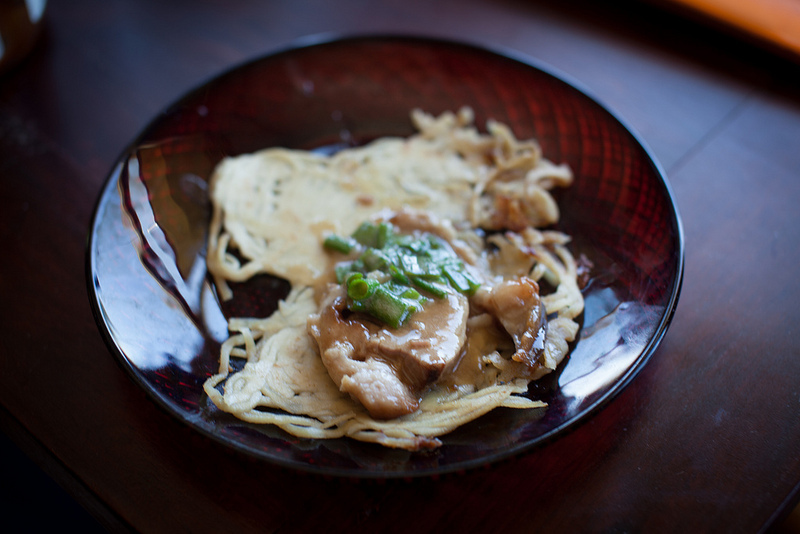 We decided to make our own chasu pork for the filling, with it’s classic ramen roots. This is a four hour process- you can do it the night before if you want. I highly recommend following this recipe for the chasu as it’s a little complicated. A dutch oven is the tool you want for this job. Heat your oven to 275. Roll up your pork (skin out) and tie it securely so that the heat is trapped in evenly. Put all of your ingredients (except pork) in your pan along with 1 cup of water, and cook on high heat until boiling. Then add your bundle of pork. Cover with a lid, but leave it ajar. Move it into the oven. Babysit it for 3-4 hours – when your knife pierces it like butter, it’s ready. 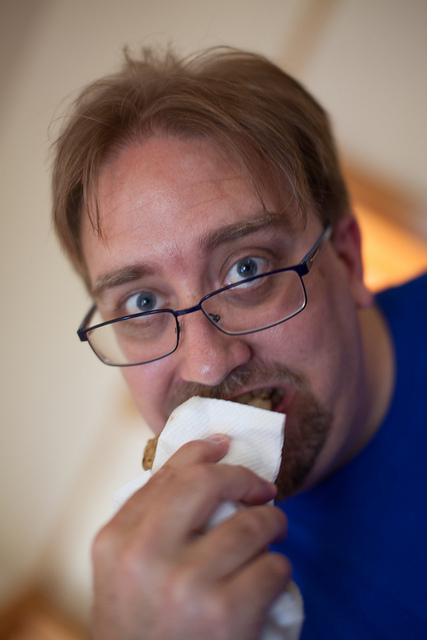 When you’re ready to use it, remove the pork and slice it into bite size thin pieces. Save the broth- you can even mix a little of it into the soup to flavor it. You can also cook your hardboiled eggs in it. 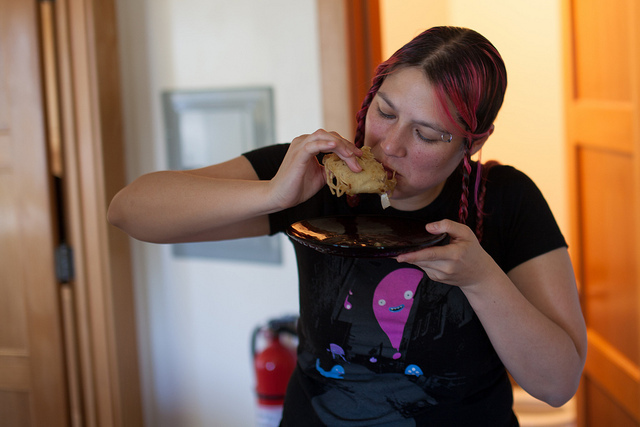 The ramen taco is a ton of work, but might be the tastiest thing you’ve ever eaten. Once you’ve made it, you’ll be sad that you can’t walk into a restaurant and buy one. 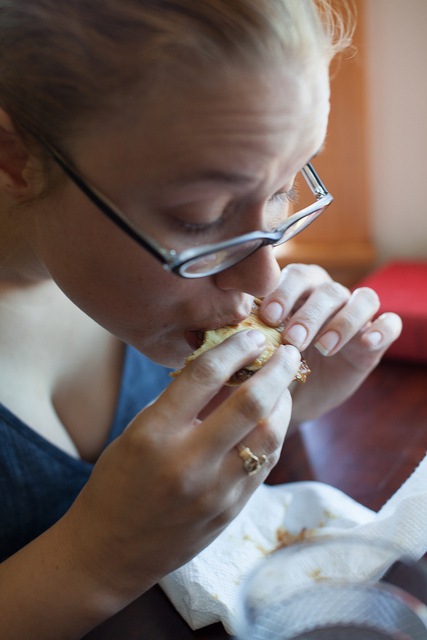 It’s a perfect balance of textures and taste, in a convenient taco shell.